Niseko is one of the most exciting location in Asia to experience the great outdoors. 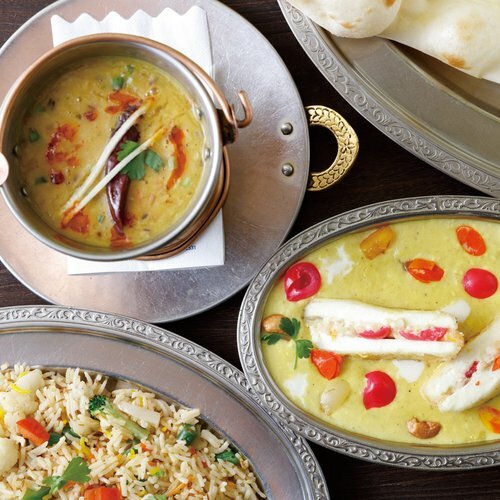 In winter and summer, you'll find a wide selection of activities that can be enjoyed by the whole family. Aside from the great skiing and snowboarding that made Niseko famous among the global snowsport scene, many fun activities are also offered from early spring to late summer. These includes golfing, kayaking, hiking, cycling and much more! In order to enjoy your time in Niseko at its fullest, it is important to get high-quality gear that will help you play more. If you are looking for a particular item that you forgot to pack in your luggage before heading to Niseko, fear not! The many outdoor shops here are sure to carry what you are after. If you also just want to go on a nice shopping trip that will let you find the latest in outdoor lifestyle fashion and Niseko-exclusive items, you'll also love the great shops that cater to the region's local residents and foreign visitors alike. Below, you'll find the best addresses our team heads to when time comes to get fitted with great garments and find the necessary accessories to help us enjoy our little corner of paradise 12 months a year! 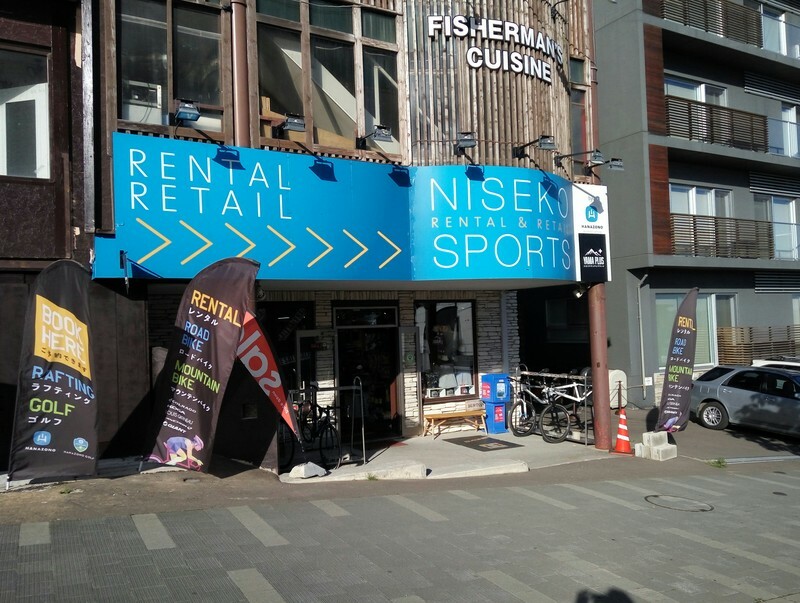 Featuring three outlets in the area, Niseko Sports offers probably the best selection of sport equipment rental in Niseko. With a focus on service, the team at Niseko Sports is available both in winter and summer to help you make the most out of your time here. To cater for everyone's requirements, Niseko Sports offers standard-range or premium level skis and snowboard equipment rentals. Among the shop's line of winter ski and snowboard rentals, you'll find the newest models by world-class brands such as K2, Rossignol, Burton, Ride and much more. Starting in December 2017, Niseko Sports will also carry the Line ski brand. Whether you are a first timer or an expert looking at exploring the best powder stashes of the world, Niseko Sports have you covered. For expert skiers eager to experience the backcountry side of Niseko, be sure to visit the team at Niseko Sports. You'll find BCA avalanche airbag-enabled backpacks available for rental. Never head out to unpatrolled terrain without one of this potentially life-saving device! 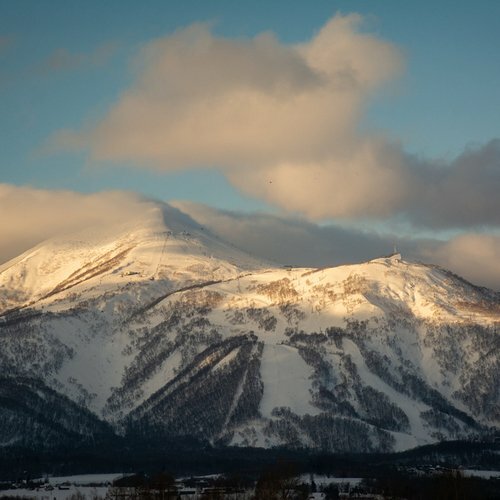 For the customers' ease, the Niseko Sports outlet on Hirafu-Zaka Street offers a complimentary return shuttle service between the store and the place where you are staying in Hirafu. Once you are ready to go pick-up your winter rental equipment, simply give the store a call and they will dispatch a driver to pick-you up. You can also pick-up the equipment as early a 15:00 the day before the actual rental start date, so you can get some late afternoon and evening skiing done on your arrival day! The team at Niseko Sports is also made of avid fans of summer activities. You'll find great bicycle available for rentals in summer from brand such as Giant, Anchor, Colnago, Louis Garneau and more! 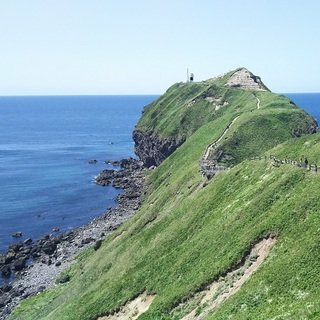 For those looking at experiencing the best summer activities, just visit the Hirafu-Zaka store to book exciting outings such as river rafting and sea kayaking. Niseko Sports also offers a wide range of products for sale, from jackets, pants, t-shirts, hats and protective gear. Niseko Sports is also the only licenced distributor of Niseko's born Yama Plus apparel line. Visit their official page to discover the latest products offered, inspired by their team members' love of the mountains. Newly opened in summer 2017, Niseko Nature Center is the newest shop to open under the famous Ikeuchi banner in the area. 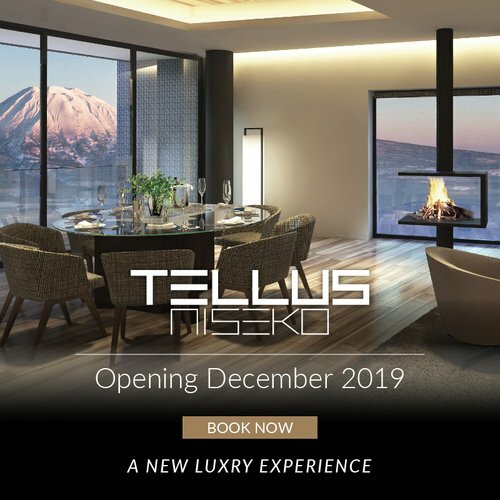 The Ikeuchi group already operate outlets in Hirafu Village inside AYA Niseko and the MY Ecolodge and another one in Niseko Village's authentic Japanese machiya-inspired shopping district. Located at the intersection of route 343 and the road that leads to the iconic Milk Kobo dairy farm, Niseko Nature Center offers activities, cycling and outdoor merchandise for retail and rental, an on-site café with outside terrace and accommodation facilities. A convenience store and a campground are also scheduled to be set up on the premises shortly. Already deeply involved in the local biking scene, the team behind Niseko Nature Center wants to share its love of cycling to the community. By hosting special events such as a preparatory training ride for the famous annual Hanazono Hill Climb, introductory days to the world of electric bicycles and special yoga events featuring Mt. Yotei as a backdrop, the Niseko Nature Center will soon be a landmark for anyone who wants to discover Niseko great cycling experience! 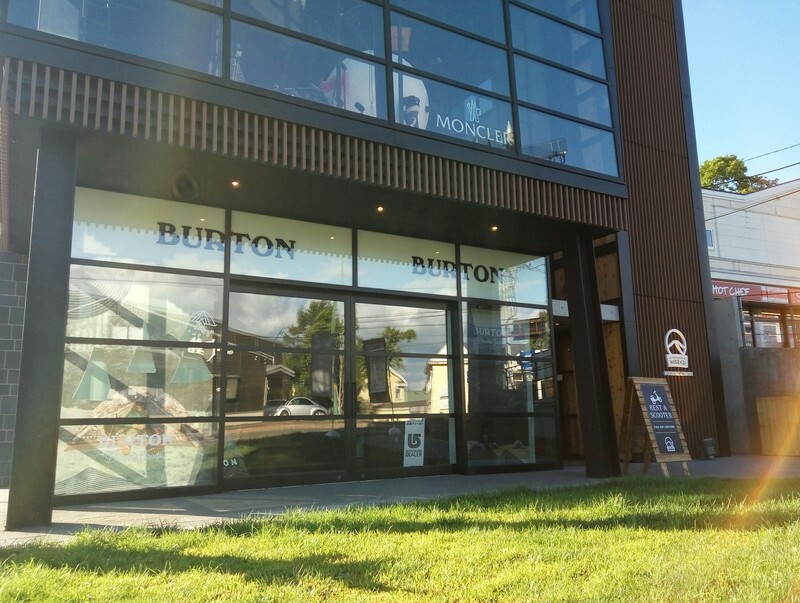 Sitting advantageously since December 2016 at the famous Hirafu intersection inside the jaw-dropping newly rebuilt Odin's place, the Burton Niseko Shop is the mecca for any fans of the most iconic brand name in snowboarding. Offering an unmatched shopping experience that features the latest equipment and accessories for snowboarders, the Burton shop also carries products from AK457, Anon. and more! A fantastic shop for anyone looking for the latest products, you'll find boards, bindings, jackets, t-shirts and backpacks available for sale. Head down there if you want to look good on and off the slopes! A long-standing institution located at the entrance of the village, the Niseko Adventure Center has been offering to the community and visitors a wide range of activities for more than 7 years. 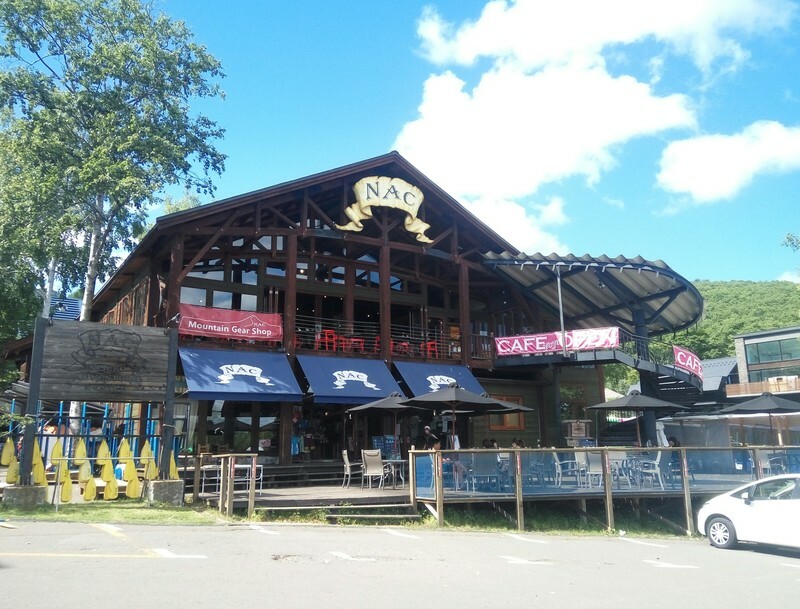 NAC is home to JoJo's cafe (try their burgers! 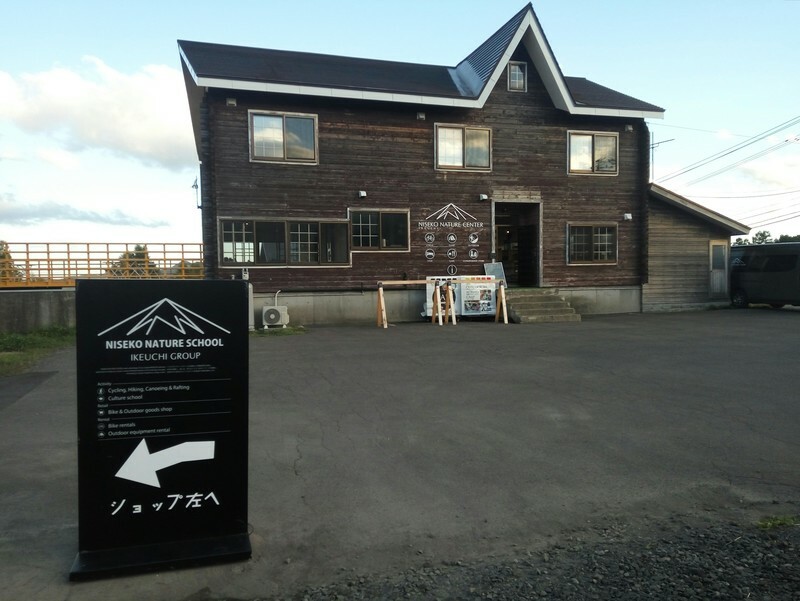 ), a mountain gear shop and Niseko's only indoor climbing wall. The NAC mountain gear shop is one of our team's favorite destination for its great quality products and reasonable prices. You'll find everything you need for your next outdoor adventure and if what you are looking after is not in store, the staff at NAC will help you order it from the catalogs. In store you'll always find a plethora of backpacks, camping and hiking accessories as well as clothes. NAC is a licenced distributors of great brands such as Mont-Bell, Marmot, Osprey, Smartwool and much, much more! The iconic Rhythm Niseko shop, open year-round. 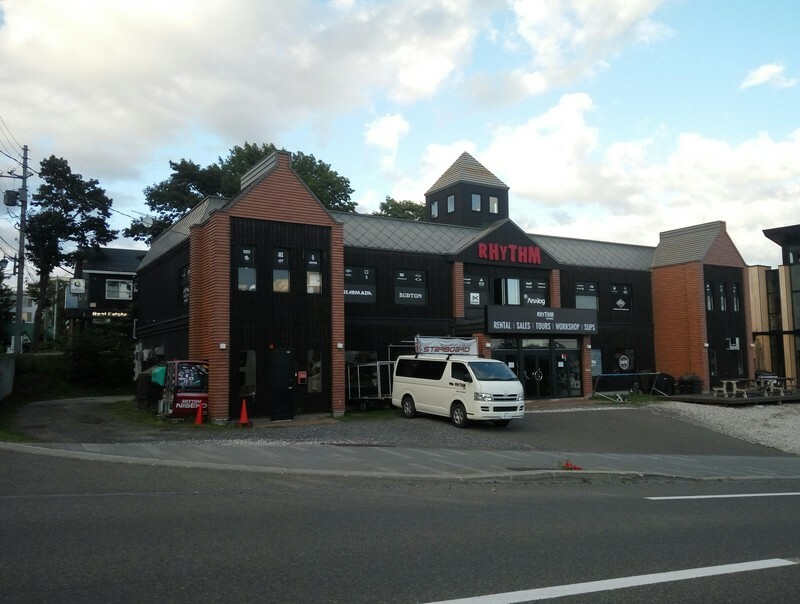 Rhythm's iconic shop and huge neon sign are impossible to miss when you visit Niseko. The place is buzzing with customers from morning to evening. 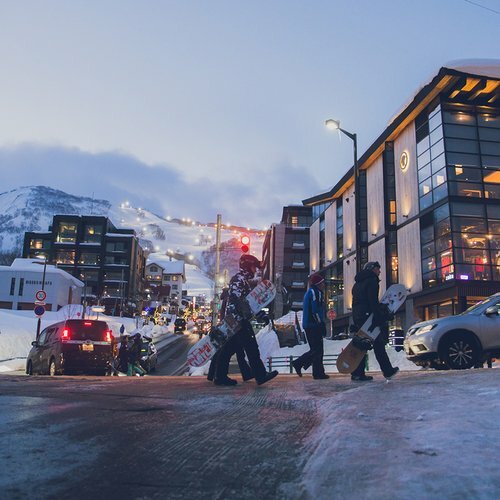 Featuring a hip vibe, a professional retail and service team and the latest skis and boards, Rhythm Niseko is the ski bum's paradise. In summer, you'll find a great selection of mountain bikes and surf boards available for sale and rental. In winter, be sure to stop by Rhythm in the morning to get your java fix - the on-site Glorious Coffee serves premium Lavazza coffee and decadent hot chocolate. For those looking at stocking up on the latest outdoor and street wear, be sure to visit the shop's offspring, Rhythm Summit, located just a few steps away on Hirafu Intersection. You'll find high-quality jackets, hoodies, gloves, beanies and much more in this smaller boutique store. Gravity is a unique concept in Niseko that exclusively retails the best products of The North Face group. 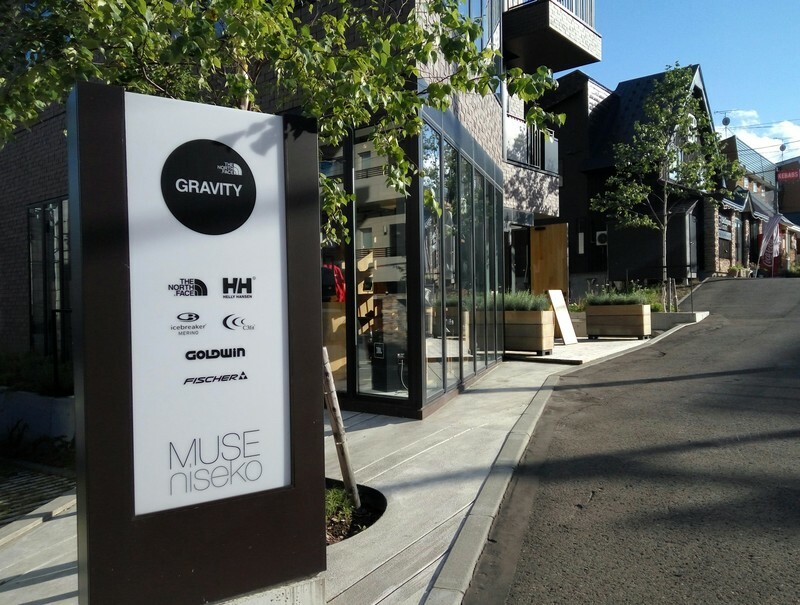 Located on the first two floors of the breathtaking MUSE Niseko towering at the entrance of Hirafu Village, Gravity offers in-season products from The North Face as well as affiliate brands such Goldwin, Helly Hansen, Icebreaker and more. You'll find officially licenced The North Face products exclusively developed for Gravity - t-shirts, caps and more. 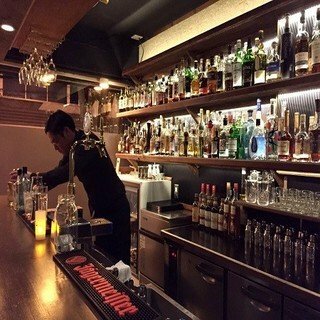 The friendly staff will be happy to welcome you in their laidback shop which also doubles as a cafe. Vacation Niseko's tip: Foreigners can benefit from Tax-free shopping! Look for the tax-free logo to save on your next purchase. For all purchases of 5,000 JPY or more, foreigners visiting Japan for less than 6 months can shop without worrying about the 8% sales tax. Look for the above logo to find a participating shops and make sure to bring your passport, which will be required to benefit from the above tax exemption! 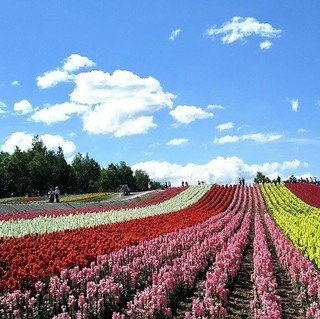 Looking for a great vacation in Japan's best outdoor resort? Don't wait and contact Vacation Niseko's friendly reservation staff if you need any assistance or suggestions for your holiday planning!